Dr. Energy Saver installs radiant barriers in attics and are experts in saving energy through your attic, as well as many other parts of your home. Radiant barrier and insulation in attics is a key part of Dr. Energy Saver 10 Energy Vital Signs, a comprehensive examination of your home's energy loss and production. For your Radiant Barrier Estimate in South Carolina, call or e-mail us today! 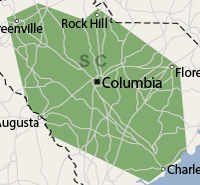 We serve Columbia, Summerville, Mount Pleasant, Charleston, Simpsonville, Lexington and surrounding South Carolina areas near Mount Pleasant, Charleston, Simpsonville, Lexington, Columbia, Summerville, West Columbia, Laurens, Hartsville, North Charleston, Piedmont, Goose Creek, Orangeburg, Camden. As your local experienced and fully trained contractor, we proudly offer affordable and cost effective solutions to meet your needs and budget. A radiant barrier in an attic can reduce air conditioning cost and expense by 10 percent or more. Radiant barriers are known by other names including, "reflective insulation" and "radiant barrier insulation." These names have caught on because, like insulation, radiant barriers can effectively slow the transfer of heat. Good insulating materials like foam and cellulose force heat to move slowly. However, a radiant barrier works differently, actually reflecting heat energy back towards it source. Some types of rigid foam insulation are manufactured with a shiny foil facing that can function as a radiant barrier, combining the benefits of insulation and a radiant barrier. In an attic the radiant barriers we use can work just like these shiny car shades. When it's hot, up to 97% of the sun's heat can be reflected back outside by a radiant barrier. This will reduce the heat gain and take a load off of your air conditioning. In the winter, this reflective effect works the other way, reflecting heat from the house back toward your living space. Adding a radiant barrier in your attic is a smart, energy saving investment, especially if you live in a warm climate. Don't rule out this kind of installation even if you live in the far north, especially if you have ductwork and other HVAC utilities running in the space, such as a furnace or air conditioner. Dr. Energy Saver can install a radiant barrier against the bottom edges of your rafters to help improve cooling efficiency in the summer and heating efficiency in the winter. Call or e-mail us for a Radiant Barrier Estimate in South Carolina. Dr. Energy Saver provides professional radiant barrier installation. We provide radiant barrier installation to Lexington, Columbia, Mount Pleasant, Simpsonville, Summerville, Charleston, Orangeburg, Piedmont, Camden, North Charleston, Hartsville, West Columbia, Goose Creek, Laurens, Chapin, Aiken, North Augusta, Greenville, Spartanburg, Florence, Sumter, Greenwood, and surrounding South Carolina areas. Call 1-888-370-6924 or contact us online to schedule a radiant barrier estimate by your trusted local radiant barrier contractor.